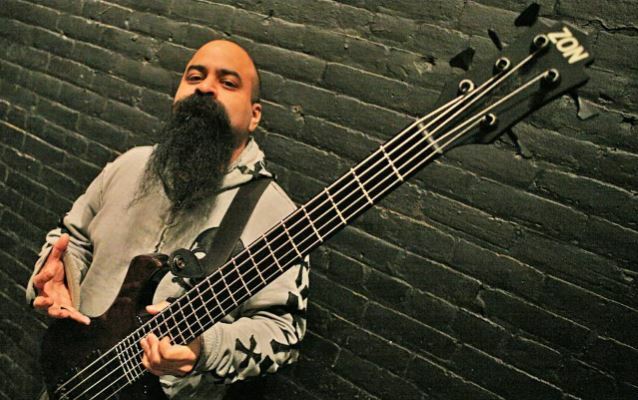 Former STATIC-X bassist Tony Campos has left SOULFLY and joined FEAR FACTORY. Campos, who is currently touring with MINISTRY, says in a statement: "[FEAR FACTORY] is the gig I wanted when STATIC-X was falling apart, and I'm really excited that I finally get to do it. "My first show with them will be at Amnesia Rockfest [in Montebello, Quebec, Canada] on June 20th, the day after I play with MINISTRY at Amnesia Rockfest. "I would like to take this opportunity to thank Max and Gloria Cavalera, and the whole SOULFLY tribe for the incredible opportunity they gave me. It was a great three-plus years, and I enjoyed every minute of it. You have my eternal gratitude, love, and respect, and I hope we can work together again in the future." Campos made his live debut with SOULFLY on July 31, 2011 at the Lokerse festival in Lokeren, Belgium and played on the band's last three studio albums: 2012's "Enslaved", 2013's "Savages" and the upcoming "Archangel". FEAR FACTORY's most touring lineup included bassist Matt DeVries, previously of CHIMAIRA (where he played guitar) and SIX FEET UNDER. FEAR FACTORY is putting the finishing touches on the follow-up to 2012's "The Industrialist" for a late 2015 release via Nuclear Blast Entertainment.